Rockford, Ill. – After four seasons with the Toronto Marlies, including a career-high 69 points (17G, 52A) in the 2013-14 campaign, and a brief stint with the Rockford IceHogs, 28-year-old forward Spencer Abbott was looking for a change after seeing only one NHL appearance thus far in his career. That change sent him across the globe to Gothenburg, Sweden, where he played for Frölunda HC last year in the Swedish Hockey League. Leaving North America to play a season in Europe was a relatively easy decision for the sixth year professional. Abbott said he had his mind made up after he ended the 2014-15 season in Rockford, and like his linemates, his family was “all on side” with the career journey. With Frölunda, Abbott skated alongside current IceHogs goaltender Lars Johansson and helped the Indians capture the Swedish National Championship. Abbott notched 35 points (14G, 21A) in 42 games for fifth on the team. One of the biggest adjustments for Abbott was the larger sheet of ice in European rinks, which forced him to adapt his style and work on his defensive play in his team’s half of the rink. He admitted to believing the game in Europe would be more offensive and suit him as a scorer. His growth in play in the defensive zone didn’t go unnoticed by his coaches. Rockford Head Coach Ted Dent, who coached Abbott in 2014-15, said he has utilized Abbott on the penalty kill this season and can count on the forward to finish out the last 15 to 20 seconds while shorthanded. “I just think he’s a more mature person and player than he was two years,” Dent said. IceHogs Assistant Coach Derek King served as Abbott’s assistant coach in Toronto and said he too, has seen improvement in Abbott’s overall play in both zones. In his return to the IceHogs this season, Abbott started the year off with 15 points (6G, 9A) in the first 25 games. King attributed the slow start to the size of North American rinks but said the adjustments Abbott has made wrenched up his play prior to the All-Star break. That fine-tuning by Abbott resulted in a team-high six-game point streak (2G, 7A) from Dec. 26 to Jan. 8. In that span he was rewarded with a recall to the Chicago Blackhawks, making his second NHL appearance on Jan. 5, the same day he was named to his second-career AHL All-Star Team. In that contest, Abbott skated on the top line with three-time Stanley Cup winners Blackhawks captain Jonathan Toews and Marian Hossa. Sam Carrick, who played with Abbott in Toronto and now currently with Rockford, was excited to see his friend succeed and earn both the call-up to Chicago and the All-Star nod. Abbott currently leads Rockford with 27 points and 11 goals. Familiarity with the IceHogs organization has definitely aided in his second season with Rockford. 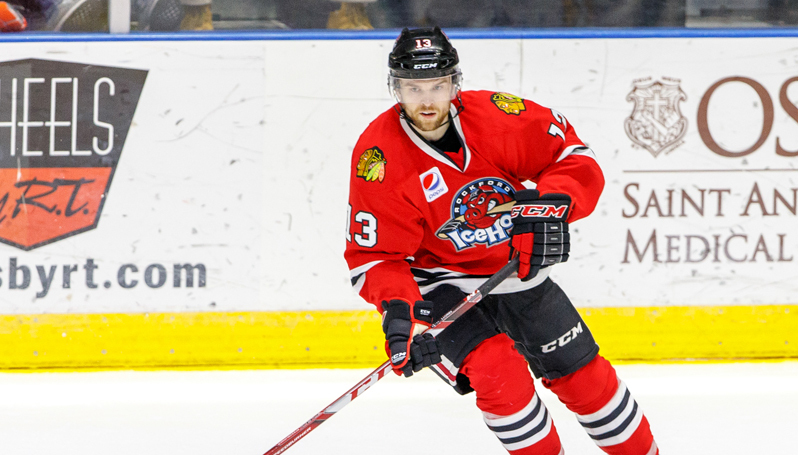 Along with the coaching staff, Abbott has reconnected with Carrick and Johansson along with a handful of players from the 2014-15 IceHogs team. His year in Sweden has also endeared him to the large Swedish contingent in the locker room. The IceHogs team boasts a locker room of seven Swedes including three players who have played with Frölunda. Abbott also lived in current Rockford defenseman Viktor Svedberg’s apartment during his time in Gothenburg. Johansson said that Abbott’s experiences living in Sweden have been something that the forward can bond over with his Swedish teammates. Abbott’s top goal is still to make it into the NHL and he has gained confidence in all phases of his game thanks to his time with Frölunda. Not known for being an overly talkative guy, King said Abbott lets his play speak volumes and act as a catalyst.